Colibri VF61 is a member of the Colibri family. You will find all technical details such as features, datasheets, software, etc. here. For starting for the first time with your Colibri VF61 you will need a suitable Colibri Carrier Board as well as some adapters and cables for connecting your desired interfaces. You can buy the Colibri VF61 module, Colibri Evaluation Board and Carrier Board Accessory Kit from the Toradex webshop. 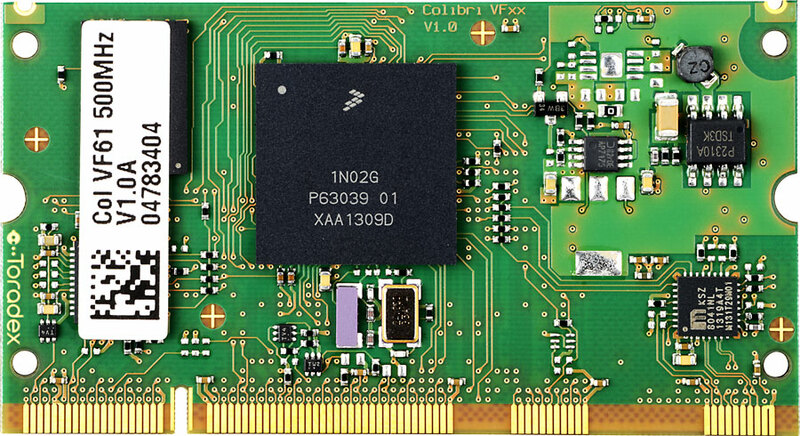 Get details including free downloads of images and BSPs for operating systems supported by Colibri VF61. The Colibri VFxx 3D model contains the PCB and all components. Depending on the module variant, some components may be not assembled. The component heights are typical values. Due to production tolerances, the actual height of the assembled components can be different. Please use the generic Colibri mechanical model with the maximum component height for testing the mechanical fit. This ensures the mechanical design fits all current Colibri modules as well as future releases. These are a generic STEP models that can be opened and modified in any 3D CAD. The second model does not contain any copper pads and therefore less complex.